There had been some snow that morning and the ceiling was a little low for the small planes to safely fly so we were delayed for a few hours. A group of us from Fort McMurray were traveling to Fort Chipewyan, Alberta's oldest settlement (established in 1788), for the opening of Canada's largest synthetic ice surface that had been installed in the Archie Simpson Arena. This was the final piece on what has turned out to be a tremendous recreational addition to this remote northern community on the southern shores of Lake Athabasca. The previous structure collapsed under the weight of too much snow in the winter of 2005. We took off from the Fort McMurray Airport (YMM), banked left and came back over the airport, Saprae Creek, and then ascended above the clouds as the Saline Creek area faded off below us. Not much to see except an endless horizon of fluffy grey cloud and too noisy to hold a conversation with any of the nine passengers, I propped my head against the cushioned edge of the Cessna charter run by McMurray Aviation, closed my eyes and drifted off into a strangely contented sleep, the drone of the engine providing a soundtrack for a most delicious slumber. In an instant we were breaking through the lower reaches of a cloudy day just above the Athabasca Delta and the marshland and river crossings that mark the final stage of the driving trip to Chip. Landing at the busy airport (YPY) we were greeted by Councillor Sonny Flett, Flossie Cyprien, Troy Nice and Ernest Thacker who piloted a series of trucks and vans that took us into town, a short ten minute drive. Among us were several members of the media, Mayor Blake and several municipal staffers. The ceremony, which had been rescheduled twice already, had been pushed back to 2 pm to accommodate the second plane of dignitaries which had been further delayed back at YMM. This gave Councillor Flett an opportunity to take me on a guided tour of the Archie Simpson Arena and the community. Our first stop was to inspect the progress of Keyano College's Fort Chipewyan Campus. The last time I was in the community it was to participate in discussions about the college's strategic plan. It was right around that time that serious discussion began about acquiring land to build a permanent campus. 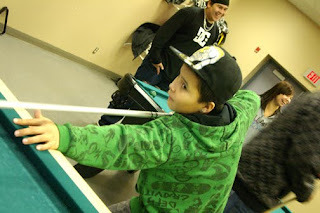 Up to now, Keyano has leased space in the MultiPlex to provide post-secondary learning opportunities in Fort Chipewyan. The new building, nearing completion and designed in the shape of the Keyano icon, will get turned over to the staff early in 2011 to begin the process of moving everything over and beginning a new era of education delivery in the community. I get the sense that everyone is looking forward to that day. We took a right on McDermot then a left on McDonald and another left on to Mellor to look at the RCMP barracks, a fixture of the community and reminiscent of a similar facility that we visited down in Coleman a number of years earlier. Sonny lives right beside the barracks on one of the community's largest lots in a comfortable home nestled in the trees. A large boat is flipped over and up on blocks, poised to wait out the winter in hopes of getting back out on the water next year. "I feel pretty safe," said Sonny chuckling. "I picked some great neighbors!" We swung south along MacKenzie, passed the Post Office and several stores that sustain the community of just over a thousand souls, then right on to Robert then left onto Daniel. Sonny was eager to show me the community's new raw water reservoir and water treatment plant. "Here you're looking at $6.5 million," he said, looking out over bubbling reservoir. Councillor Flett is visibly proud of the work that has been done to improve the lives of his constituents as we turn back on to McDonald Street to return to the Archie Simpson Arena. While we waited for the second plane to arrive we walked over to the bright blue community hall adjacent to the arena for a quick lunch of homemade chicken soup and sandwiches. Councillor David Blair and his lovely wife Blue Eyes joined us. 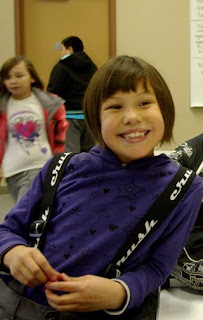 Blue Eyes has spent her entire life in Fort Chipewyan. "Did you know Alice Tourangeau?" I asked. "Sure I knew Auntie Alice," she said. I can't remember what she said about how the two families connect, as conversations about genealogy often leave me confused, so I won't even attempt to take a guess. "Oh my goodness," I said. "Alice is my oldest son's great grandmother!" Alice was one of the great souls in my life who left us over a decade ago, a longtime resident of Fort Chipewyan who raised a large family, the eldest son being Dylan's Grandpa Joe. It's indeed a small world. As residents and community leaders began gathering in the gym for the opening ceremony, the adjacent youth centre rec room was buzzing with activity. I took the camera and captured some of the fun and many of the smiles. The ceremony was nice, complete with speeches, a ribbon cutting and ceremonial skate, but it was the conversations with the kids and the parents that made this trip so special. I appreciated the chat with Mrs. Marcel who shared her perspective on life in the northern town. I appreciated watching my Councillor colleagues, Sonny and David, filled with pride as this was such a great day for their community, and a profound pay-off for their efforts. Of course, the reason we had flown north for the day was to officially open the synthetic ice surface. Here is an excerpt from the RMWB's news release: The Archie Simpson Arena synthetic ice is the largest surface of its kind in Canada and the largest in the world that has hockey lines and goalie creases. The total cost of the project was $559,000 and the installed product was Global Synthetic Ice's Super-Glide surface. 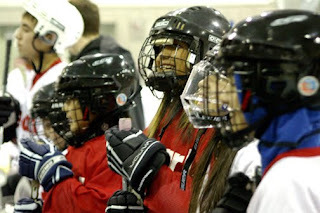 The ice surface has garnered plenty of international attention, with ESPN Magazine and the New York Times inquiring about the installation of the ice in Fort Chipewyan. 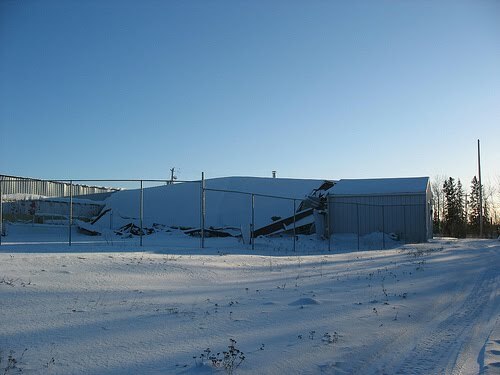 From the urban centre where state-of-the-art facilities are somewhat taken for granted, it's hard to fully grasp what this day meant for the residents of Fort Chipewyan. 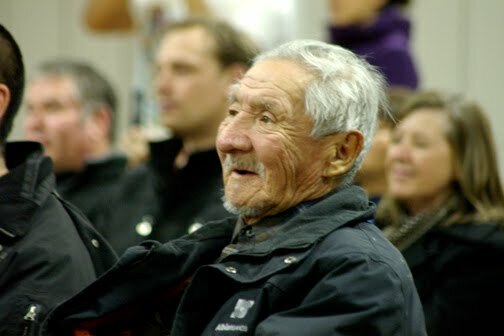 It's hard to imagine the view from this elder's eyes as he looks on, watching his community adapt to changing times. I got the sense from Councillors Blair and Flett that they didn't want us to leave. They feel so strongly about their home and were eager for us to take it all in, as much as we could. It was an honour to be there, and personally, I can't wait to return. I'm especially looking forward to hopping on Sonny's boat and dipping my fishing rod into Lake Athabasca; an over-sized lake trout is swimming under the ice calling my name.